Dr. Pereira sees patients at CRM’s Tribeca office in Lower Manhattan. For more information or to make an appointment, contact Megi Zeku at (646) 962-7499. Dr. Pereira’s broad clinical expertise encompasses reproductive disorders such as anovulation, amenorrhea, polycystic ovarian syndrome (PCOS), endometriosis, recurrent pregnancy loss and abnormal uterine bleeding. Within the realm of fertility care, Dr. Pereira provides his patients with individualized treatments including ovulation induction, controlled ovarian stimulation, IVF/ICSI, and oocyte donation, as well as oocyte freezing for fertility preservation. He is a skilled surgeon performing minimally invasive hysteroscopic and laparoscopic surgeries for the treatment of benign fallopian tube pathologies, ovarian cysts, uterine fibroids, septate uterus and endometrial polyps. 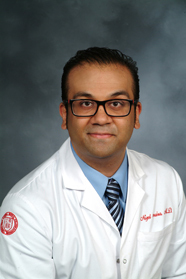 His certification from the American Association of Bioanalysts in Andrology and Embryology also allows him to assimilate the knowledge of established laboratory techniques into the treatment plans of his patients and their partners. Dr. Pereira is a Diplomate of the American Board of Obstetrics & Gynecology, Fellow of the American Congress of Obstetricians and Gynecologists and board-eligible in Reproductive Endocrinology and Infertility. He is fluent in English, Hindi, Urdu, Konkani, and Kannada and proficient in medical Arabic.